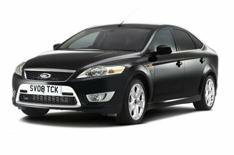 Ford adds new top trim to Mondeo range | What Car? Ford has added a new flagship model to its Mondeo range, called the Titanium X Sport. It is available in five-door hatchback and estate body styles, and has 18-inch alloys, twin chrome exhausts and body-coloured side skirts. Inside, features include red stitching on the leather seats and a leather-covered steering wheel and gearknob. There is a choice of two engines: the existing 216bhp 2.5-litre turbocharged petrol or a new 172bhp 2.2-litre diesel. The diesel accelerates from 0-62mph in 8.4secs and has a top speed of 139mph. It averages 45.6mpg and emits 165g/km of carbon dioxide. Standard equipment includes a six-CD player, rain-sensing wipers, automatic headlights, front and rear park assist, dual-zone climate control and a start button. Upgrades over the standard Titanium include advanced Bluetooth connectivity, bi-xenon lights, alloy pedals and sports suspension. Prices start from 23,355 for the five-door model and 26,605 for the estate. What Car? Reliability Survey - what does it reveal about car owners?